Of the images of the church that emerged from the Second Vatican Council, the people of God was the most important and the most popular. For almost 20 years, it was a constant in the Catholic vocabulary, even entering into liturgy. But from the beginning, it was regarded as suspect. The late Cardinal Avery Dulles in Models of the Church worried about its democratizing subtext. Others probably feared it as subversive of hierarchical authority. John Paul II neglected it, preferring the magisterial (institutional) model of the church, and sometimes even the teaching church seemed to be reduced to the pope alone. For me the real news, potentially the most church renewing news, in Pope Francis’ interview is his revival of the understanding of the church as the people of God. “The image of the church I like,” Pope Francis told Father Spadaro, “is that of the holy, faithful people of God....There is no full identity without belonging to a people. No one is saved alone, as an isolated individual, but God attracts us looking at the complex web of relationships that take place in the human community. God enters into this dynamic, this participation in the web of human relationships.” This is Big Tent Catholicism, with a church that welcomes all. For me the other headline in the Francis interview is the re-focusing the church on the Gospel. God’s love is the center once more of the church’s preaching. Morality has a place, but it is secondary to the Gospel of God’s love and mercy. To be sure what Pope John Paul II called “the Gospel of Life” has a place in the church’s proclamation as it has had from the beginning. But it is not the central message and what Pope Francis calls the “obsession” with sexual morality has distorted Catholic pastoral and practice and social ministry, especially in the United States. “The proclamation of the saving love of God comes before moral and religious imperatives,” he told his interviewer. Popular response has already made obvious how people now hear the good news in the Gospel once again. New Evangelization? 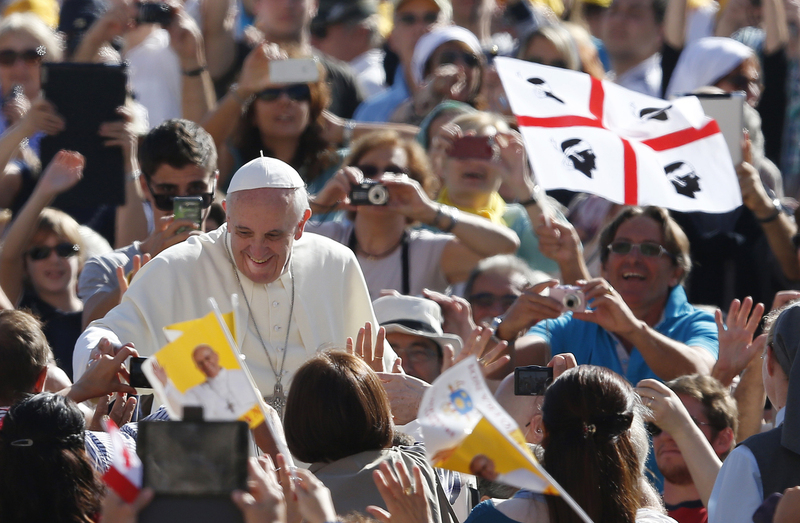 Pope Francis is the New Evangelization personified.